"There was a big problem when we were making the pilot, because the network thought that I was too fat to play the role of myself." 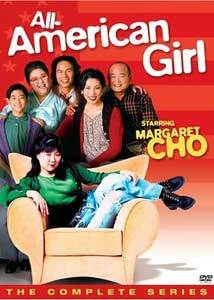 All-American Girl was a big deal when it premiered on ABC in 1994, the first television show about an Asian-American family. Ostensibly based on the standup comedy of the notoriously filthy comedian Margaret Cho, it was to break down barriers and be something different, a smart sitcom in a sea of mediocrity. Except little of Cho's brash personality made it to the screen, and, in the end, the series is about as bland and middle-of-the-road as they come, never mind the cast's ethnicity. Though the actors are all Asian and almost all of the episodes deal with issues of race, the show's one-note characters, simplistic plots and tired punchlines feel like they could have come from a million other sitcoms. Cho plays Margaret Kim, the Americanized daughter of Korean immigrant parents. She has an adversarial relationship with her mother, Katherine (Jodi Long), who cares very much about the family's place in the Korean community, but gets along better with affable (but Asian, don't forget Asian) TV dad Benny (Clyde Kusatsu). Katherine wants Margaret to be more like her brother (B.D. Wong) who dates nice Korean girls (er, except for the "girls" part), but that crazy Margaret would rather date a white auto mechanic, which I guess makes her a rebel. The only memorable character is Grandma (Amy Hill, actually closer to Cho's age), Benny's mother, who does little more than sit in front of the TV all day. She's basically a surrogate for the mother in Cho's comedy act, treating all aspects of American culture as some kind of alien curiosity. Hill really makes the character work, and she's the reason I looked forward to revisiting the show 12 years later. It doesn't surprise me that Hill's character is so funny, but I really don't remember everything else being so bland. Certainly I like Cho as a comedian; I even got a chance to see her perform live a couple of years ago. But the show just does not work. Every episode hits the same notes, with Margaret and her mother clashing over the cultural divide, and most of the side characters are just so much window dressing. The show is centered around the idea of being culturally significant, rather than memorable characters. The most interesting part of the short-lived series, and perhaps the explanation for why it seems so boring and safe despite a, for the time, revolutionary concept, was the constant behind-the-scenes retooling. Cho went through hell to put out these 19 episodes, basically. The network thought she was too fat, so they made her lose weight to play herself. An Asian consultant was hired to make sure the Asian actors acted Asian in just the right way. The ratings were good enough to keep it on the air for a while (and attract some interesting guest stars, including Quentin Tarantino and Jack Black), but it was constantly being re-tooled, and by the final show, Margaret wasn't even living at home anymore�she'd moved out to live with a bunch of white people, a concept intended as a sort of backdoor pilot for a new take on the series. It didn't stick, Cho was miserable, and All-American Girl ended after one season. I guess I used to watch a lot of bad sit-coms (I always thought I didn't watch a whole lot of TV growing up, but now that its all coming out on DVD, I've been forced to re-evaluate my memories). All-American Girl was apparently one of them. I did like it at the time (meaning, after Grace Under Fire), but now, it just seems like more of the same. It broke barriers, and maybe it even made a difference�diversity on television is never a bad thing, and I certainly enjoy the Korean-American family that features prominently on Gilmore Girls�but it's odd to watch a show about a Korean-American family filtered through a Hollywood studio's idea of what a white audience would accept a Korean-American family to be. Cho dealt with a lot of stress with this program, both from the network execs who expected her to bring in big ratings and the Asian community that expected her to represent their lives on TV. Under pressure, and without any real support from the network, she basically had a nervous breakdown, an experience she recounts in detail in her fierce and funny one-woman show I'm the One That I Want (which would serve as a nice companion piece to this complete series DVD release). It's too bad so little of her personality made it to the small screen�if it had worked, the television landscape might be a much more colorful place today. Image Transfer Review: The 1.33:1 image looks pretty nice, if a lot like what it is�early 1990s sit-coms all have that same flat appearance. Colors are fine, if a bit dulled, detail is fair (though the image, sourced from video, is a little soft). The source tapes look pristine, as well they should, since these episodes probably haven't been seen much since they originally aired. Audio Transfer Review: Audio is presented in a basic mix that places the vocals front and center and filled out with a typically over-enthusiastic laugh track. Extras Review: Considering the anguish Cho went through during this show's production, it's surprising she's able to talk about it without gnashing her teeth. But she does, in commentary tracks for four episodes. On the pilot, Mom, Dad, This Is Kyle and Disc 4's Pulp Sitcom she flies solo, spending most of her time pointing out how the show switched around her life story and how, in this or that scene, her hand is on her stomach because she's so hungry due to a network-mandated crash diet. She also isn't a fan of her character's hair or clothes, it would seem. Actress Amy Hill (Grandma) joins her for Take My Family, Please and The Apartment, and the two reminisce about the series but spend a lot of time off on odd tangents that won't mean much to anyone who isn't either Margaret Cho or Amy Hill. Disc 1 also includes a retrospective featurette, All-American Girl A Look Back (19m:41s), with new interviews with Cho and Hill. They talk frankly about what they felt went wrong with the show, and generally kabbitz about all the micro-managing that drove it into the ground. They very perceptively point out that the focus was so much on race and "Asian issues" that the network suits ignored important things, like character. Cho: "It's really what keeps Asian-Americans invisible in television and film, that we can only tell stories that are about race... and that's where political correctness becomes racism." It's not all bad, though�they do talk about the positive impact of diversity on TV in general. The set is nicely packaged and episodes include five chapter stops, but there are no subtitles. As a sit-com, All-American Girl is all-around average, but as a cultural artifact, it's pretty fascinating. Shout Factory has found a niche releasing failed programs, and while this one doesn't exactly fit in with late lamenteds like Undeclared and Freaks and Geeks, it's a nice presentation of a unique television time capsule.